An email notification containing all details is sent to the customer and also sent to you/your staff. This email will be "from" the email that you set up as the notification email on your SETTINGS page. If you are a multi-location user, you can also choose (on the SETTINGS page) to have the system use the applicable email based on your Locations (the emails that you have assigned to each Loc under Tools>Edit Settings>Locations). In the brief example below, one student registered for one class, and the fields that you required are shown, along with payment information. (Due to length, the E-signature and Policies are not shown in this example). 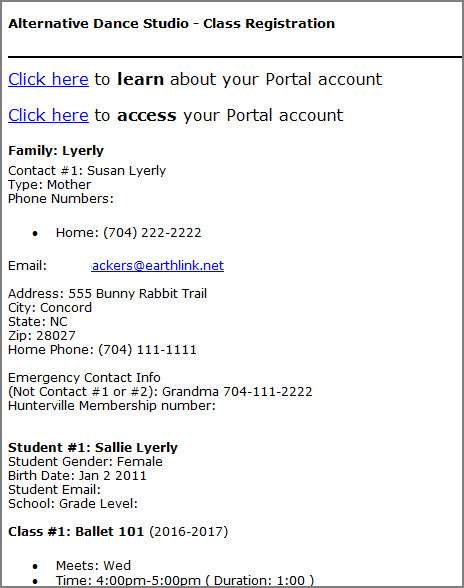 If your Parent Portal is activated, the confirmation will also include a link to the Portal as well as a helpful video on how to use the Portal. This is just an example - yours may vary slightly based on your settings. Additionally, the class Instructor may receive an email if you have that setting turned on (see the Instructor Enrollment Email Prompt section). Refer back to the Testing section to run through a test to see exactly what you (as the organization) and you (as a mock new customer) will receive as email notifications.